A breakthrough by a Cardiff medical science company has attracted a £400,000 investment package. 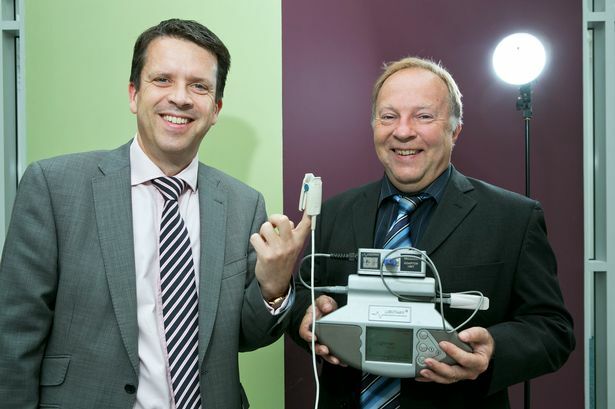 The Lightman, designed and patented by The Electrode Company which is based at the Medi Centre in Cardiff, is said to be the first device to calibrate the sensors which show levels of oxygen and other vital signs in patients. The company is aiming to achieve £2.5m of annual sales in the next two years and is looking to create a factory employing 12 people. A spokesman for the firm said that up to 30% of sensors used in 11,000 hospitals worldwide are inaccurate at any one time, giving a false picture to doctors and possibly contributing to incorrect diagnoses and treatment plans. Dr Geoff Mathews, chief executive of The Electrode Company, said:“We set up a business in the 1990s repairing sensors and found that many of them were inaccurate. Lightman tests the accuracy of sensors used by Pulse-Oximeter equipment, which measures blood oxygen levels. “Oxygen therapy is an increasingly important part of medicine, particularly for patients with chronic conditions and premature babies, he said. Lightman is said to be the first portable and easy-to-use calibrator in the world. Electrode Company fellow director Dr Veronica Hickson said: “Sensors are such an essential tool to modern medicine that it is vital that they function properly. The firm’s funding package of £400,000 is supported by Finance Wales, HSBC and Cardiff City Council. Advantage Accountancy of Cardiff acted for The Electrode Company. Mark Hislop of Advantage said:”The Electrode Company has developed a brilliant technical product at the cutting edge of technology which has a global market, and has protected it by patent. The Electrode Company is now planning expansion. The business has bases at the Medi Centre at the University Hospital of Wales in Cardiff, and at Usk. The latest round of investment will be used to create a Cardiff-based factory to build the Lightman, sales of which have already reached £500,000. The company plans to take on 12 staff in the next two years and to raise turnover to £2.5m in that time, added Dr Mathews. A spokesman for The Electrode Company said: “At present 50 hospitals in the UK use Lightman and feedback on the product is most encouraging. Dr Mathews said: “We believe this can be a global product, and we have protected it with a patent to prevent imitation.